Do You Take Advantage of Special Offers? I am by no means an extreme couponer, but I keep myself armed at all times with a coupon appnewpaper on my phone, peruse the Sunday newspaper or keep my eye out for special deals via TV, radio, internet, Facebook, twitter, etc. My favorite deals are when they are giving away big-ticket items for free. Over the years, I have scored a flat screen TV, iPod, $500 visa card and a few others for switching or trying a new service. Recently, I saw a Kindle Fire being offered, I was tempted, but for now I am holding my ground! 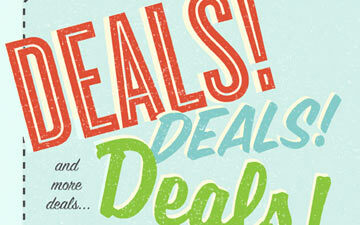 Have you scored any great deals? ← Pet or No Pet, That is The Question??? ?